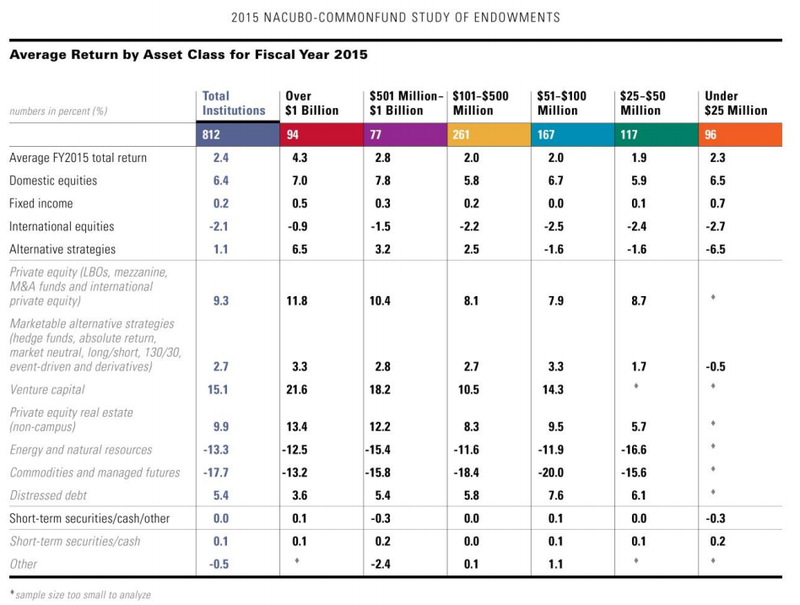 NACUBO（The National Association of College and University Business Officers）has released how endowments performed in fiscal 2015. Endowments are U.S. universities’ investment fund, which includes both large and small universities such as Harvard and Yale, and manages assets from several million to several billion dollars. Nowadays, there are 812 endowments in the US and their total assets are about 529 billion dollars. Let’s take a look at the summary below. 1.Participating institutions’ endowments returned an average of 2.4 percent (net of fees) for the 2015 fiscal year(July 1, 2014 – June 30, 2015) compared with 15.5 percent for the 2014 fiscal year. 2. This year’s return was the lowest since the -0.3 percent reported for FY2012 and contributed to a decline in long-term 10-year average annual returns, to 6.3 percent from last year’s 7.1 percent. 3. While the average endowment was about $651.5 million in size, more than half the study participants had endowments that were below $115 million. Both traditional and alternative investments performed poorly in FY2015. In FY2014 instead, equities gained more than double digits, bonds were up 5% due to the declining long-term interest rates and alternative investments performed double digit positively as well. In FY2015, though, equities were flat or a bit negative, bonds performed poorly due to yields hitting bottom and alternative investments did not go well because of underperforming energy and natural resources sectors. By the way, have endowments drastically rebalanced their portfolio since they performed really badly in FY2015 ? Well, we will discuss their asset allocation next time.